Overall, the idea of assertion-based genealogy continues to intrigue me. It feels simpler — I add a source and list the facts/hypotheses found in it, and the system takes care of linking it all up. 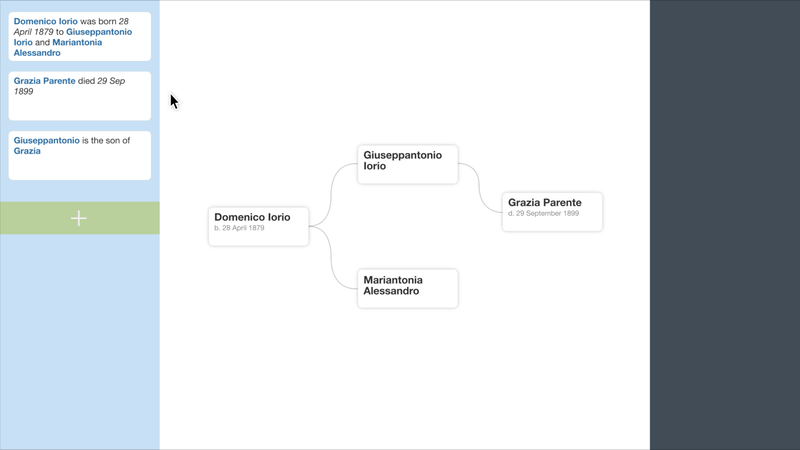 Toward the end of the video, the mouse clicks on the first fact and it dims, and Domenico and Mariantonia disappear from the chart area. The idea here is similar to toggling a layer’s visibility in Photoshop — disable a fact to see what the chart looks like without those conclusions. I didn’t mock this up, but I envisioned the right (empty) sidebar being used for analysis, somewhat like my Family Analysis prototype, and for flagging errors (a father born after his child is born, a mother dying two years before she gives birth, etc. ).